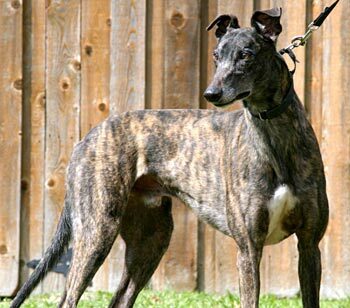 Smiler is a 5 ½-year-old brindle male born October 20, 2002. His sire is Magnitude and his dam is Pulse. Smiler was hot stuff on the race track, racking up 150 races. His racing career began in Wheeling, West Virginia, on July 3, 2004 and ended at Valley Race Park in Harlingen, Texas, on December 1, 2007. 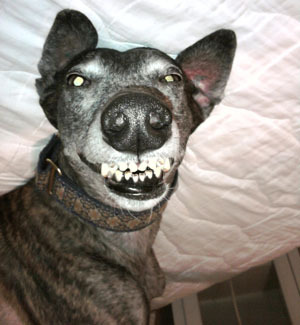 Smiler lives up to his name and will quite frequently give you a very toothy grin. 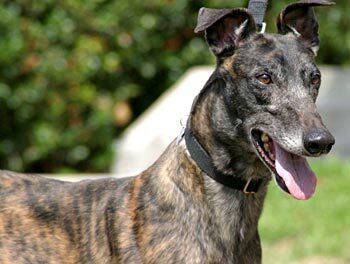 He is hoping that this does not scare anyone away and will bring him good luck in his search for a forever home. It is not known at this time if Smiler is small animal or cat tolerant.